Although your adventure is only just beginning with this downloadable PlayStation Vita point and click puzzler, Jacob Jones and the Bigfoot Mystery: Episode One - A Bump in the Night's fiendish challenges will truly put you through your paces. The first instalment in the series is barely four hours long, yet with over 20 truly tricky tasks, you'll be forced to work for the content. Indeed, it can be a challenging game – but it's also a very well designed one. The narrative adopts a Saturday morning cartoon feel, but provides a comprehensive introduction to the charming cast and characters, with plenty of dialogue and some utterly gorgeous visuals. The title boasts plenty of bold colours and attractive scenery, and even includes some clever 3D effects that take advantage of the Vita's motion sensors. You play as the titular Jacob Jones, a bright young boy who is more interested in the great outdoors and nature than socialising with folks around his age. At the start of the game, the protagonist's parents drop him off at Camp Eagle Feather, hoping that he'll strike up a relationship with the other attending children and the quirky onsite staff. Fortunately for the eponymous hero, a Bigfoot sighting turns an unwanted holiday into an exciting adventure. 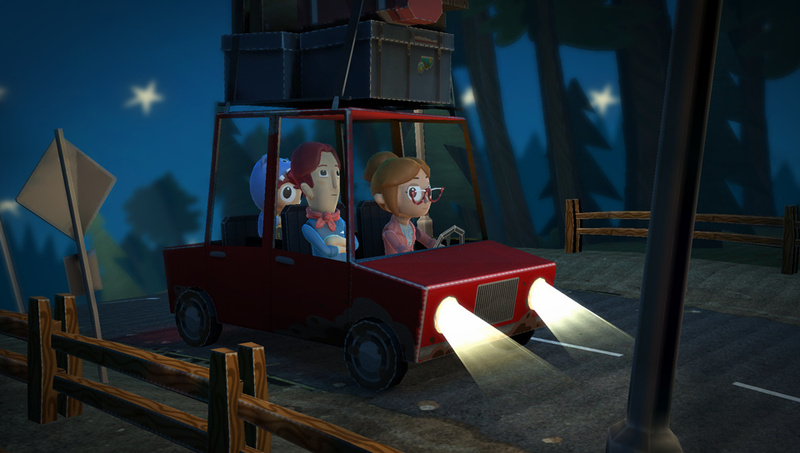 On the way to the vacation location, as well as within, you'll encounter numerous puzzles, all of which require the use of the touch screen to solve. These are typically easy enough to understand, but offer a surprisingly stiff challenge when it comes to actually completing them. Shuffling the contents of a shelf to match the riddle-esque requirements of your bunk mates demands some deductive thinking on your part, and restoring power to the camp by lighting every bulb on a circuit board puts your pattern recognition to the test. 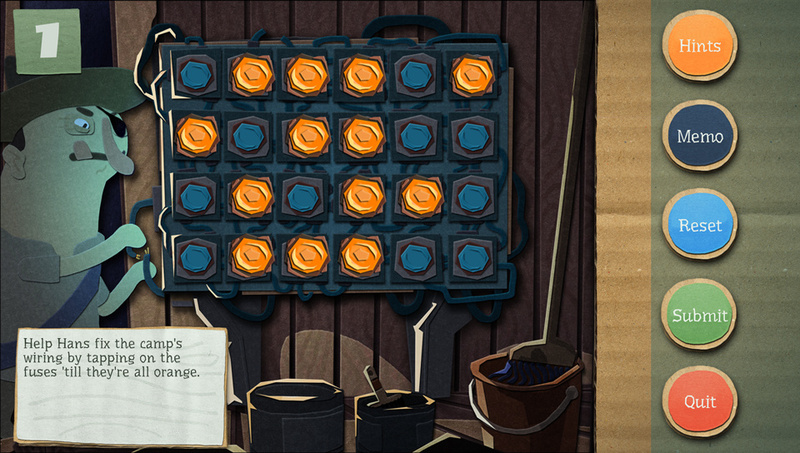 The puzzles are varied, clever, and always a lot of fun to solve. 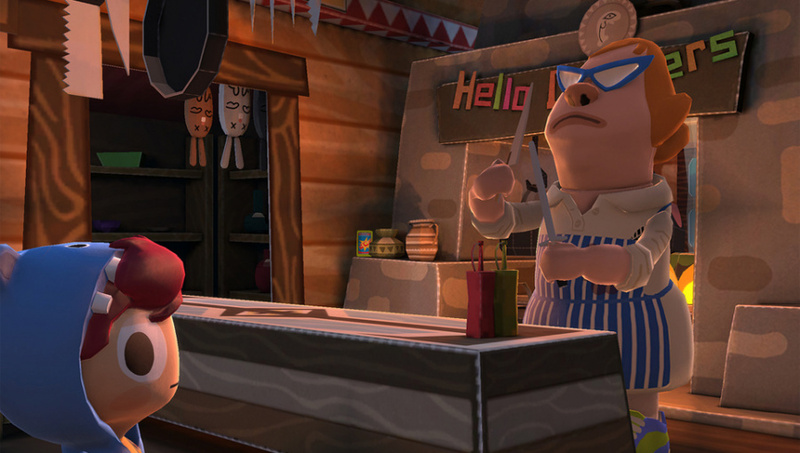 However, the game's devious difficulty does clash somewhat with its juvenile world. 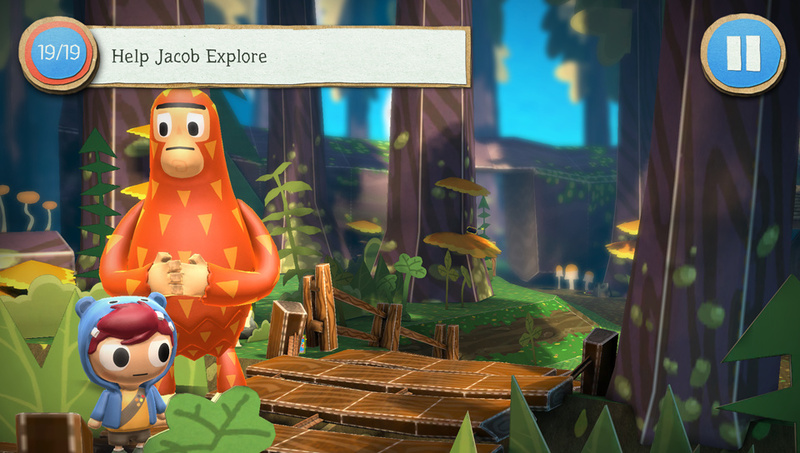 The title's cardboard cut-out presentation, vinyl toy characters, and light dialogue encourage the idea of a child-friendly game, yet the tasks skew towards a much older audience. There is a hints system if you get stuck, and you can skip the puzzles entirely if you want to move on with the story, but you'll be limited to the number of times that you can do this. For every puzzle that you do complete, though, you'll earn credits. These can be invested into the aforementioned hints system. The first tier shows you a message board with perhaps one useful hint and several jokes, while the second allows you to contact your uncle for advice. Finally, the last option lets you phone your older brother for more specific hints. Each tip costs one to three credits respectively, but you'll earn plenty of these from playing the game, so there's very little reason to worry about wasting them. Failing a puzzle reduces the amount of Merits that you earn, although these points appear to represent little more than a superfluous scoring mechanic. It's possible that they'll be explored in future episodes, but seems unlikely. As for the skip puzzle option, you're only allowed to use this three times per playthrough, and can always return to a specific challenge from the pause menu if you like. It does feel like you're short-changing yourself a touch if you opt to leapfrog a stage, but at least the feature's there to keep the narrative flowing when you're totally stumped. Outside of the puzzles, the game does a really good job of inviting you into its immersive world. It fulfils all of the clichés that you'd expect, from the overweight kid to the weird girl with a crush. The dialogue is brilliantly written and voiced throughout, and you'll quickly develop an attachment to the cast. Furthermore, the plot is compelling enough to push you through to the episode's conclusion – and will leave you longing for more. 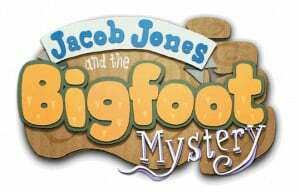 Jacob Jones and the Bigfoot Mystery: Episode One - A Bump in the Night sets the scene on an enjoyable world, and introduces some entertaining puzzles in the process. The stiff challenge is well balanced with lots of hints, though the difficulty does feel a little at odds with the child-friendly aesthetic. Nevertheless, the presentation is exquisite throughout, and we're already looking forward to the next instalment in this charming series. The artstyle kinda reminds of Littlebigplanet and The Cave. I'm looking forward to this too. I hope the story and characters and exploring are all really good, because that's what makes games like Professor Layton really shine. I thought this game was a full installment not in parts, so how many parts will be in this game to make it complete? $2.99 is going to be the price of all the parts? I would really like some more information about these questions before I start dumping money into this title. In some ways I am happy for the installments. $2.99 is a very small entry fee to see if I like this game that looks pretty good. In other ways it is frustrating. I am sure I won't want to have to wait for the next installments. I'd rather experience the story at my own pace. @readytorelease There are going to be five episodes, each costing $2.99. So, a total price of $14.95. Fun game! Puzzles are very tough. It looks like a kids game but the gameplay is definitely not. I think episodic games are a great idea. Small entrance fee and than if the game is good enough to hook one in....that feeling of looking forward to a new episode, like reading a series of books. @get2sammyb: $14.95 seems okay for the full game, will each story be added to the next or will we have 5 different game bubbles for each?